The authors describe a fluorometric assay for cardiac myoglobin (Mb), a marker for myocardial infarction. An Mb-binding aptamer was labeled with pyrene and adsorbed on the surface of graphene oxide (GO) via noncovalent and reversible binding forces. This causes the fluorescence of pyrene (best measured at excitation/emission wavelengths of 275/376 nm) to be quenched. However, fluorescence is restored on addition of pyrene due to the strong affinity between Mb and aptamer which causes its separation from GO. Fluorescence increases linearly in the 5.6–450 pM Mb concentration range, and the lower detection limit is 3.9 pM (S/N = 3). 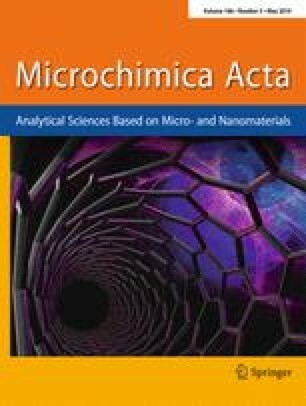 The assay was applied to the determination of cardiac Mb in spiked serum, and satisfactory results were obtained. 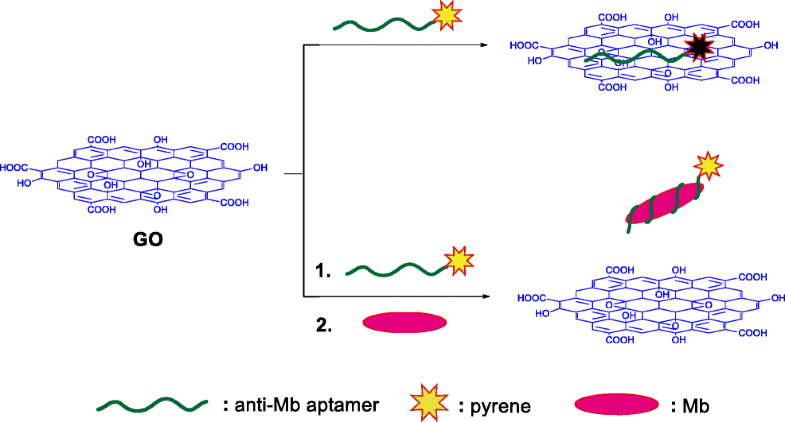 Schematic presentation of the detection of Mb (cardiac myoglobin) by using a fluorometric method based on pyrene-modified anti-Mb aptamer and GO (graphene oxide) through fluorescence quenching and subsequent recovery. The online version of this article ( https://doi.org/10.1007/s00604-019-3385-x) contains supplementary material, which is available to authorized users. The Authors acknowledge the National Natural Science Foundation of China (No. 21677060 and 51503079), the Public Welfare Research Project of Zhejiang Province (No. LGF18B050004), the Natural Science Foundation of Zhejiang Province (No.s LY16B050007 and LQ19B050002), the Program for Science and Technology of Zhejiang Province (No. 2018C37076) and the Science and Technology Plan Project of Jiaxing City, China (No. 2017AY33034 and 2018AY11002) for funding this research. Human sera sample used in this work was obtained from a healthy volunteer. This study was performed on the consent of the healthy volunteer and approved by the Medical Ethics Committee of Xin’an International Hospital (Jiaxing, China). The authors declare that they have no competing interests.